Add fun to math practice time with fun algebra games online! Do ‘fun’ and ‘algebra’ sound like they don’t go together? 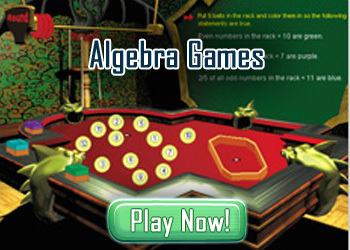 Well, then Math Blaster's algebra games are just what you need! Yes, you read that right. Algebra begins in preschool, and interactive algebra games will help young learners grasp simple algebraic concepts much more quickly. Extending patterns and sorting and classifying objects are simple algebra games that kids can play preschool. As they grow older, kids learn more advanced algebraic concepts, even if they do not recognize it as algebra. With fun and interactive algebra games, you can ensure your kids are hooked on to algebra even before they get to middle school! A good introduction to algebra is important if students are to perform well in algebra in high school. Pre algebra games help middle school students practice important concepts like factors, exponents and mathematical operations with signs. The better they get at solving these problems, the easier they will find algebra in high school! The very term algebra is unfortunately quite intimidating for many high school students, but it doesn’t have to stay that way. There’s no substitute for practice to get better at algebra, and free algebra games online are a simple way to get students to exercise their algebra skills. Fun, fast paced online algebra games are exciting for high school students, and can even aid in understanding through unique representations of algebraic concepts like graphing. Whether your kids are five, fifteen, or anything in between, get them hooked on to fun algebra games now – you won’t see such enthusiasm for algebra anywhere else!